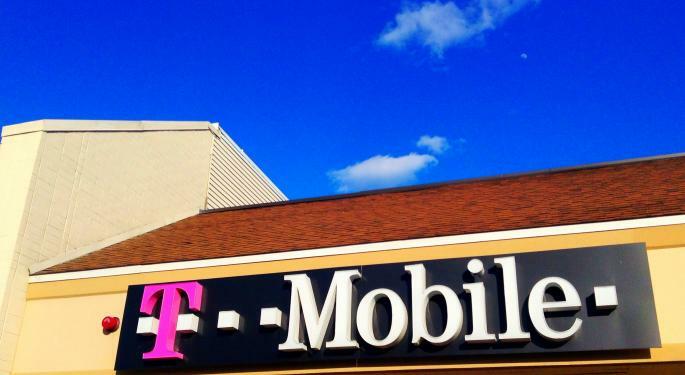 T-Mobile US Inc (NASDAQ: TMUS) shares are up more than 8 percent Monday following a big earnings beat by the telecom giant. 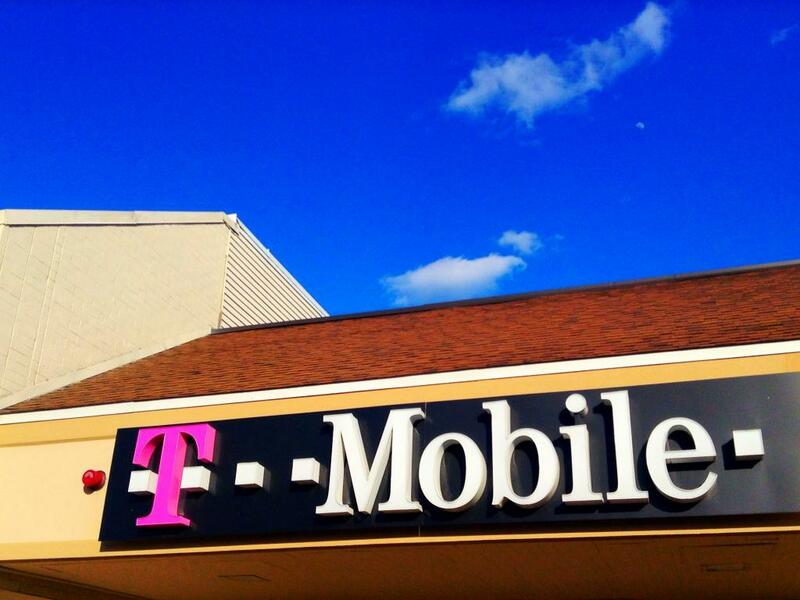 T-Mobile reported EPS of $0.27, topping analyst estimates of $0.21. Q3 revenue of $9.2 billion came up short of consensus estimates of $9.5 billion. However, the market is cheering T-Mobile’s 2.0 million subscriber additions, a 10 percent beat. 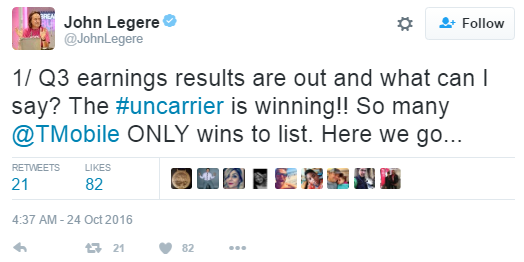 CEO John Legere was certainly proud of the company’s quarter, and he hasn’t been shy about it on Twitter. Prior to this morning’s earnings release, Legere tweeted that followers could expect a #tweetstorm from him following the news. 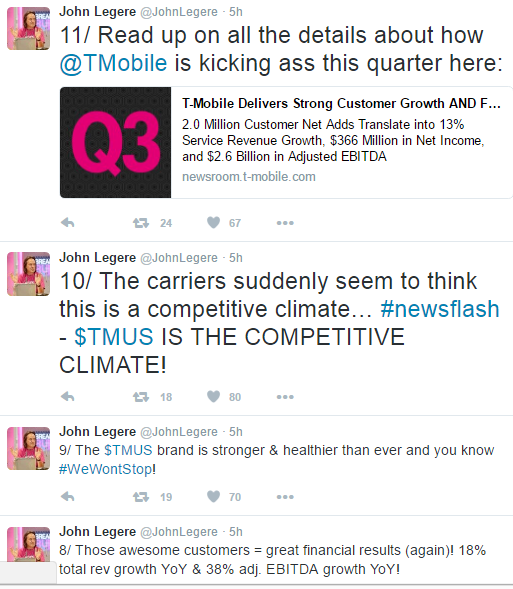 According to Legere, T-Mobile has taken all the net phone growth over the past 14 quarters. In addition, Legere tweeted that T-Mobile is the only carrier that has been constantly growing both postpaid and prepaid numbers for the past 13 quarters. In all, Legere sent out 12 tweets in a matter of minutes touting T-Mobile’s performance compared to rivals AT&T Inc. (NYSE: T), Verizon Communications Inc. (NYSE: VZ) and Sprint Corp (NYSE: S). T-Mobile’s big move has traders making bets on Sprint ahead of tomorrow’s Q3 earnings announcement. Sprint shares are up nearly 6 percent on Monday. 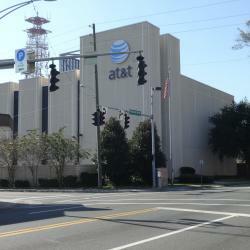 Verizon shares are mostly flat in Monday’s session, but AT&T shares are down more than 1.5 percent as the market continues to digest its proposed $85 billion buyout of Time Warner Inc (NYSE: TWX).